Before the age of branding and logos, the radiator emblem proudly proclaimed the vehicle's manufacturer. In what is believed to be the largest collection of automobile emblems, badges, and license plates in the country, familiar labels from Ford, Packard, and Oldsmobile are displayed alongside the emblems of forgotten models. 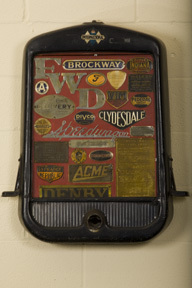 Car badges, a sign that the motorist belonged to an automobile club, are also on display. 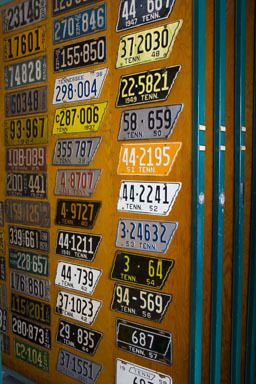 The license plate exhibit represents every state in the union and includes only a fraction of the plates in the museum's collection. This important collection of automobilia also includes automobile lamps and horns, hood ornaments, and other accessories that added to the pleasure of driving.